It’s no secret that nuclear arsenals worldwide pose a serious security threat. What’s less well known is the enormous threat posed by the cost of U.S. nuclear weapons. The U.S. is on track to spend an estimated $1 trillion on nuclear weapons over the next thirty years, according to analysis by Ploughshares Fund grantee the Monterey Institute. Why so much? Because even though the Cold War ended over two decades ago, Cold War thinking persists at the Pentagon. That $1 trillion is going to replicate a Cold War nuclear arsenal that makes no sense in the 21st century. 21st century security threats like cyberattacks and climate change are very different from the threats we faced twenty years ago. 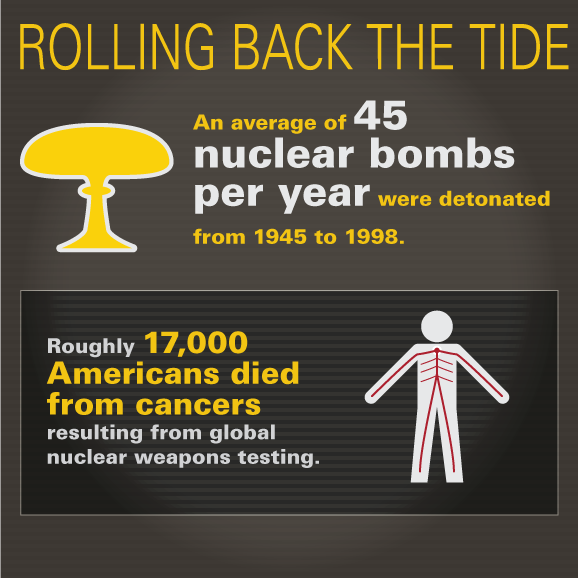 Nuclear weapons can’t address 21st century threats - so why do we continue to invest in them? The budget crunch created the perfect opportunity to ask this question. And Ploughshares Fund grantees were ready to take that opportunity to address the nation’s lingering nuclear weapons complex. Our nuclear budget campaign, spearheaded by groups like the Arms Control Association, Council for a Livable World, Federation of American Scientists, Taxpayers for Common Sense, and Women’s Action for New Directions worked to create a new conversation about the unacceptable costs of nuclear weapons. Slowly but steadily, that conversation is gaining momentum. The idea that we should fund the future rather than the past is taking hold. Our budget campaign has significantly reduced or delayed budgets for several of its original targets: including the plutonium bomb core facility and the new nuclear submarine. Every dollar spent on nuclear weapons programs is a dollar not spent on more important national security priorities. Understanding this, thanks to the work of the nuclear budget coalition, members of Congress are now openly questioning how much we are spending on nuclear weapons. And they are offering an increasing number of amendments that take money from the nuclear weapons budget to spend money on other national security priorities. But the work of the nuclear budget campaign is far from over. The costs of maintaining and modernizing the U.S. nuclear arsenal will explode soon, as programs to build a new fleet of nuclear-armed submarines and a new nuclear bomber really take off. The nuclear weapons budget is about to pose a real threat to more important defense programs - and that is a real opportunity for our coalition. With your support, we will win the nuclear budget debate and eliminate these relics of the Cold War.